Розглянуто поняття ідеографічного словника та тезауруса, а також охарактеризовано різні типи цих словників. Представлено класифікації слів для англійської, німецької та французької мов. Описано етапи та результати проведеної лексико-семантичної класифікації дієслів української мови. Показано застосування ідеографічних словників для представлення результатів досліджень з лексичної семантики. Keywords: lexicography, ideographic dictionary, lexical-semantic classification, thesaurus. Background: Rapidly developing technologies demand from linguistics, in particular, from lexicography to adapt fast by digitalization of paper dictionaries and creating electronic dictionaries of different types. This paper is dedicated to the problem of ideographic classification of lexical units. The notion and different types of ideographic dictionaries are explained. The usage of ideographic dictionaries for lexical semantics is outlined. Purpose: The purpose of the study is to describe the main steps of our lexical-semantic classification of the Ukrainian verbs, as well as to explain the representation of its results in the form of an ideographic dictionary. Results: There is no unified classification of the lexical units. For the Ukrainian language, most of the researches in this field analyze specific lexical-semantic groups of verbs, but not all the verbs altogether. The current classification was performed in three stages. In the first stage, available classifications of the Ukrainian verbs were analyzed and compared. In the second stage, the classification was extended by using Dictionary of semantic themes of verbs (conducted in the Ukrainian Lingua-Information Fund). It was automatically created out of the electronic version of the Dictionary of the Ukrainian Language in 11 Volumes and thus their verbs as semantic themes represent all Ukrainian verbs. In the third stage, the most detailed classification was performed out of results from stage two by using all meanings and all nuances of meaning of each verb. Ideographic dictionaries show the regularities of the structure of lexical-semantic groups and the seme structure of words. That is why the results of our lexical-semantic classification of the verbs of Ukrainian language were represented in the form of an ideographic dictionary. Discussion: The presented classification offers one of the variants of the lexical-semantic classification of verbs of the Ukrainian language and cannot claim to comprehensively solve the problem of the typology of verbs. Depending on the purpose of research current classification can be extended and as a result, the ideographic dictionary will be more detailed. Mariya Bihday is assistant at Department of Applied Linguistics at Lviv Polytechnic National University. Her areas of research interests include lexical semantics, lexicography, applied linguistics. Ключові слова: лексикографія, ідеографічний словник, лексико-семантична класифікація, тезаурус. One of the important and rapidly developing branches of applied linguistics is computer lexicography. Computer lexicography is, on the one hand, an applied scientific discipline, between linguistics and computer science, which studies the methods and techniques of applying information science and technology techniques in theory to the practice of creating a wide range of lexicographic systems, and on the other hand, the computer industry, which is rapidly developing mainly due to the fact that lexicography is one of the effective ways of knowledge detection and dissemination (Shyrokov 4). Updates of fundamental lexicographic works, both content, and structure, to adapt them to the realities of our time. Digitization of paper dictionaries, by changing them into lexicographic databases, so that they can be used in various systems of automatic processing of information. The use of dictionaries in knowledge mining systems, as well as in conceptual and lexicographic knowledge representation systems (e.g. ontology). Use of dictionaries to solve the problem of multilingualism (for example, the means of computer-technological support for multilingual lexicographical systems). As we can see, modern lexicography aims at computerization, therefore the creation of electronic ideographic dictionary is actual for the Ukrainian lexicography. On the other hand, there are many approaches to the division of verbs into lexical-semantic groups and today there are many semantic classifications of verbs for different languages. However, for the Ukrainian language, particular lexical-semantic groups of verbs were predominantly studied (verbs of movement, verbs of thinking, etc. ), but not the unified lexical-semantic classification of all verbs. Therefore, the purpose of this research is to describe how the lexical-semantic classification of the Ukrainian verbs can be conducted and represented in the form of an ideographic dictionary. 1) Academic dictionary vs. dictionary-handbook. The academic dictionary includes normative dictionaries representing the lexical system of language, or the terminology of one specialty; handbook includes encyclopedic, terminological of several specialties, explanatory, regional (dialectal), etymological ones. 2) Encyclopedic vs. a general dictionary. 3) Thesaurus vs. explanatory or translation dictionary. The first one gives words with quotations from texts that illustrate the use of words, that is, provide the linguistic material, while the second reflects the lexical system of the language and compares it with the system of another language. 4) Ordinary vs. an ideological or thematic dictionary, in which the units are located under the headings of the semantic network. 5) Explanatory vs. translation dictionary. 6) Non-historical vs. historical dictionary. The articles of the latter give information on the development of the semantics of the word, from its first registration in written sources and to the modern time for a given dictionary. Nowadays the multilingual WordNet thesaurus of the Princeton University (for eight European languages – English, Dutch, Italian, Spanish, German, French, Czech and Estonian) successfully operates and develops on the Internet, as well as electronic linguistic database EuroWordNet, and similar GermaNet, BalkaNet, RusNet, etc. for other languages. An ideographic dictionary is a multifunctional tool that allows solving various theoretical and practical tasks. It helps to find the word that most adequately conveys a certain notion. The ideographic article shows the systemic links of words, facilitating the process of learning of the words for a foreigner. The ideographic dictionary is also valuable for theoretical studies. Its synoptic scheme is a fragment of the picture of the world of the specific language. The dictionary reveals the originality of the language, the peculiarities of the embodiment of particular notions in words, the regularities of the structure of lexical-semantic groups and the seme structure of words. On the material of the dictionary, you can conduct cognitive research, create knowledge bases in the form of frames, semantic grids. The regularities established by the generalization of the meanings of a large number of lexical units into a limited range of notions enable us to carry out a logical-semantic analysis in systems of automatic processing of texts (Serednytska). When considering the general methodological principles of the classification of notions, V. Morkovkin distinguishes three types of ideographic dictionaries: 1) ideographic thesaurus; 2) educational ideographic (thematic) dictionary; 3) an analogous dictionary. In this case, the main task of the author of a dictionary of the first type is the identification and subsequent rational classification of notion groups that are actually represented in the vocabulary of the language. The purpose of composing of analogous dictionaries is a representation of the thematic organization of vocabulary, without abandoning the principle of the alphabet. When creating educational thematic dictionaries, the main task is to select the topics relevant for educational purposes (Morkovkin 22). Yu. Karaulov considers two main types of thesauri: 1) general-language and 2) information-retrieval. In fact, he notes that "there is no fundamental difference between the general-language and the information-retrieval thesaurus: a thesaurus is a lexical tool for information-retrieval systems. It consists of a controlled, but the changeable vocabulary of terms, between which semantic links are indicated" (Karaulov 148). At the same time, the aim of general-language thesauri is a complete description and lexical representation of a certain area of objective reality, while information-retrieval are aimed at an analysis and a logically consistent presentation of the existing and generally accepted terminology of a given industry (Karaulov 156). As a result, the main difference between information-retrieval and general-language thesauri is the subject of their action, i.e. the difference between the term and the word. Yu. Karaulov writes: "From here it becomes clear that, firstly, the impossibility of such detailing of descriptors in terminology dictionaries, (...), and secondly, the emergence of general-language thesauri in the classification schemes, along with the fully-fledged, so to speak, descriptors, and key words that are justified here, by striving to uniformly, without gaps, fill the given descriptor area with a vocabulary and which would be inadmissible on the basis of such a premise in the terminological thesaurus" (Karaulov 156). The ideographical research has been carried out over the last 150 years in many countries. In the 19th century, P. M. Roget composed an ideographic dictionary of the English language. His most famous followers were E. Blanc, P. Вoissiere, R. Hallig, and W. von Wartburg, F. Dornseiff, J. Casares. For Russian, ideographic dictionaries were composed by Yu. Karaulov, V. Morkovkin, a group of authors led by E. Kuznetsova, and later by L. Babenko, O. Baranov, N. Shvedova. In Ukrainian linguistics, ideographical studies were conducted by I. Hetman, M. Peschak, N. Klymenko, Ye. Karpilovska, Zh. Sokolovska, N. Snizhko, O. Siruk, A. Serednytska, and others. The problem of ideographic classification of lexical units remains relevant and not fully discussed in Ukrainian linguistics. Traditionally, the results of the ideographic description of the vocabulary are written in the form of a dictionary. It is built on the onomasiological principle, from a notion to a word. The input to the dictionary is a synoptic scheme – a system of concepts, or notions that generalize the meaning of large groups of words. Each concept corresponds to a vocabulary article, lexical units of which express it in the language. The main feature of ideographic dictionaries is the onomasiological orientation of their construction from an idea (a notion, a concept that can be expressed by a word or phrase) to signs (a specific lexical-semantic variant) that reflect this notion. The core of ideographic dictionaries is the so-called synoptic or integrated diagram of concepts – the basis of the semantic vocabulary classification, the layout of the units of the ideographic dictionary, built using the methods of constructing a thesaurus. If in traditional explanatory dictionaries the register units are lexemes with their lexical-semantic variants of words, then in the paper ideographic dictionary the core function performs first of all the notion or the concept. Each concept corresponds to a set of semantically related lexemes, the seme structure of which correlates with the content of a certain notion (Siruk). One of the Ukrainian researchers O. Siruk highlights the following basic principles of the organization of lexical material in the ideographic dictionaries. These principles are: systematic principle, the principle of variability, the principle of intercrossing of verbs between different semantic classes (Siruk). The systematic principle is realized in the construction of a lexical-semantic field, within which there are smaller groups, between which synonymous, antonymic, and other types of relations are established. Each token must be comprehensively described as an element of a certain lexicographic type or several types if it lies at the point of their intersection. In this case, all the features of the specified type or types should be described in one scheme in different parts of the dictionary. The embodiment of the principle of variability is that in each lexical-semantic group the dominant verb is defined, which expresses the basic semantics of the group of words, and there are other verbs, which have additional semantic features in comparison with the dominant, and thus specify its meaning. The principle of the intersection of verb groups is involved in the analysis of the complex semantics of verbs, which in their meanings can enter simultaneously into several groups of verbs (Siruk). 3) the creation of a new form of grouping lexical material within a separate vocabulary article – the division of verbs into synonymic series on the differential features of their meanings, the division of derivative verbs into subfields by word-building attributes. In the tables (Table 1. and Table 2.) and the list below 3 main lexical-semantic classifications of words made for different languages in the last 150 years are listed, in particular: English (Roget), German (Dornseiff) and French (Bally). Roget’s classification was the first one and later was the basis for many other classifications. In each of them, the linguistic picture of the world is captured and many similarities between them can be observed. Traditionally, methods of componential analysis and step-identification (in the terms of E. Kuznetsova (Kuznetsova)) are used for linguistic research related to lexical semantics, in particular for lexical-semantic word classifications. 1. Comparison and generalization of existing semantic classifications of verbs of the Ukrainian language. 2. On the material of the Dictionary of semantic themes of verbs (conducted in the Ukrainian Lingua-Information Fund (Sukharyna)), we divided verbs that are semantic themes into lexical-semantic groups. 3. Clarification and extension of the generalized lexical-semantic classification of the Ukrainian verbs using the methods of componential analysis and step-identification. For the first stage, we have chosen lexical-semantic classifications of verbs of Ukrainian researchers V. Rusanivsky, O. Leuta, and S. Dyshleva. As a result, 10 lexical-semantic groups were defined that are common in these classifications (verbs of action, verbs of movement, verbs of attitude, verbs of state and process, verbs of mental and social actions of the subject, verbs of being, verbs of location, verbs of characterization, modal verbs, phase verbs). In the second stage, each of the 2393 verbs mentioned as semantic themes in the Dictionary of semantic themes of verbs was taken and using the denotative approach for each verb lexical-semantic group from the first stage was defined. This Dictionary of semantic themes of verbs contains an alphabetical list of all verbs that are semantic themes and represent all the verbs of the Ukrainian language. That is why we think that by dividing these verbs into lexical-semantic groups, we obtain a generalized lexical-semantic classification of the whole Ukrainian verbs. In this step definitions of verbs were taken from the Dictionary of the Ukrainian Language in 11 Volumes (DUL), but only the main meaning of each verb was considered. During the third stage of the lexical-semantic classification of verbs, we have made more detailed classification by analyzing each meaning and each nuance of the meaning of each of the 2393 verbs. For this, the classification presented in the Ideographic dictionary of the Russian language by L. Babenko was used and modified to the needs and peculiarities of the Ukrainian language. In this step componential analysis was used to define semantic components in the meaning of each lexical-semantic group of each verb. And also, a method of step-identification was applied to determine the limits and volume of lexical-semantic groups. As a result, 4 big lexical-semantic groups were defined (verbs of action, verbs of being, verbs of state, verbs of relation) with many lexical-semantic sub-groups. After that, the presented lexical-semantic groups and sub-groups were transformed into an ideographic dictionary of verbs of the Ukrainian language. All dictionary entries of all 2393 verbs were put there together with their grammatical information, number of meaning or its nuance, description of meaning and examples. The generalized lexical-semantic classification of verbs of the Ukrainian language, which is conducted in our research, can be used, in particular, for the semantic marking of verbs in the text corpora, the creation of ideographic dictionaries, etc. Such an ideographic dictionary of verbs has different lexical-semantic groups as the main concepts of the dictionary. Further, for each lexical-semantic group, not the whole verb but only fitting lexical-semantic variants of verbs are listed. 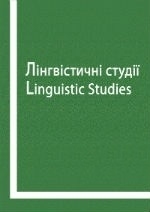 Ideographic dictionary of Ukrainian verbs can be used for linguistic research, university studies, as well as be embedded in different systems of computational linguistics. In this paper, the history and state of ideographic researches were outlined, in particular, the main classifications of words in English, German and French languages were shown. Additionally, the definition and different types of ideographic dictionaries were described. In conclusion, it has been pointed out that for studies in lexical semantics ideographic dictionary is means for representation of lexical data. For our research, it was used for generalized lexical-semantic classification of Ukrainian verbs. As our lexical-semantic classification does not cover all possible details of each lexical-semantic group of Ukrainian verbs, further discussion and research in this area can be conducted to extend the presented ideographic dictionary as much as possible. Babenko, Lyudmila. “Tolkovyj slovar' russkih glagolov: Ideograficheskoe opisanie. Anglijskie ekvivalenty. Sinonimy. Antonimy” Moskva: AST-PRESS, 1999. 704. Print. Bally, Sharl'. “Francuzskaja stilistika.” Moskva: Editorial URSS, 2001. 392. Print. Dornseiff Franz. “Der Deutsche Wortschaftz nach Sachgruppen.” Berlin: Walter de Gruyter, 1959. 922. Print. Karaulov, Yuriy. “Lingvisticheskoye konstruirovaniye i tezaurus literaturnogo yazyka.” Moskva: Nauka, 1981. 148-150. Print. Kuznetsova, Era. “Voprosy metalinhvistiki.” Stupenchastaya identyfkatsyya kak sredstvo opisaniya semanticheskikh svyazey slov. Leningrad: LGU, 1973. 84-95. Print. Morkovkin, Valeriy. “ Ideograficheskiye slovari.” Moskva: MGU, 1970. 12-22. Print. Roget, Peter. “Roget’s Thesaurus of English Words and Phrases.” Harlow: Longman Group Ltd, 1983. 1247. Print. Serednytska, Anna. “Ideohrafichnyi podil diieslivnoi leksyky v suchasnii ukrainskii movi.” Diss. Instytut movoznavstva im. O.O.Potebni, 2001. Abstract. Print. Shcherba, Lev. “Yazykovaya sistema i rechevaya deyatelnost.” Moskva: Editorial URSS, 2004. 428. Print. Shyrokov, Volodymyr. “ Kompiuterna leksykohrafiia.” Kyiv: Naukova dumka, 2011. 347. Print. Siruk, Olena. “Tezaurus diiesliv ukrainskoi movy: linhvistychni problemy ta metodyka konstruiuvannia.” Diss. KNU im. Tarasa Shevchenka, 2006. Abstract. Print. Dictionary of the Ukrainian Language in 11 Volumes. Kyiv: Naukova dumka, 1970–1980. Print. Sukharyna, Nataliya. “Hramatychna ta leksychna semantyka ukrayins'koho diyeslova v leksykohrafichniy systemi.” Diss. Instytut movoznavstva im. O.O.Potebni, 2003. Abstract. Print. Надійшла до редакції 27 жовтня 2018 року.